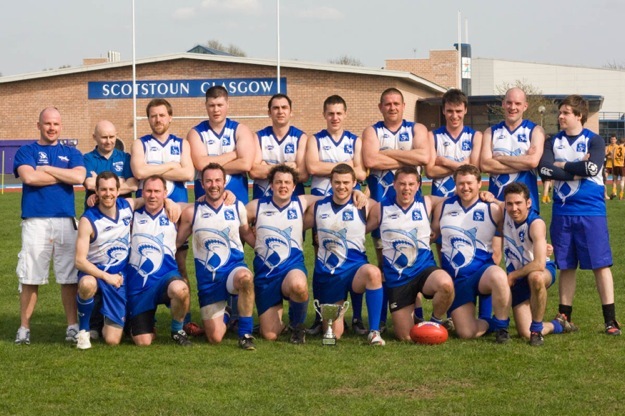 The 8th Annual Haggis Cup was held at Scotstoun Stadium, Glasgow on Saturday 9th April, bringing 8 club teams from across Europe together for an Australian Rules festival. The eight team competition saw the Glasgow Sharks, Edinburgh Bloods, Huddersfield Rams, Dublin Demons, Aberdeen Dingoes, Wimbledon Hawks, Milano Footy club and Solna Axemen battle it out with the endeavour to become cup winners. The semi-final saw Glasgow Sharks take on Edinburgh Bloods and Wimbledon Hawks against the Huddersfield Rams. With Glasgow and Wimbledon just shading their opponents in highly competitive semi-finals a close grand final promised to follow. In an intense 10 minute halves format the crowd was right behind the home team in the grand final. It was finally Glasgow’s chance to shine as the sun beat down and the Sharks came away victorious for the first time in 8 attempts. Glasgow 31 defeated a brave but tiring Wimbledon 15. AFL Europe board member Douglas Hunter of Glasgow has seen the Haggis Cup grow considerably in both size and quality over its 8 years. "We could not have asked for better spring weather to hold the annual Haggis Cup. The competition was fierce, fair and played with great sportsmanship. We are very pleased to see the obvious commitment and passion for the sport from all teams and support volunteers," Hunter said. Being of partial Scottish heritage you can imagine the joy for me of seeing a Scottish victory over the English. Slàinte Glaschu!! !